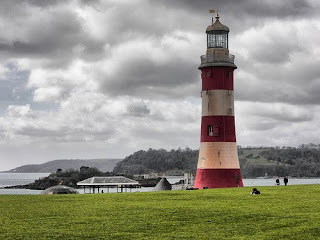 I watched a performance on the Hoe at Plymouth (UK) recently. It was given by a handful of theatre students and put together in a couple of hours in response to a class task. Yet, by sketching arrivals, greetings, reflective silences, departures, making modest gestures and a restrained representation of contrasts the students were able to recruit both the symbols and the users of the public space around them to a narrative of incoherent plates of military and domestic experience sliding by (and sometimes grinding and compressing) each other. The Hoe is a large open space, supposedly once the battleground of two ancient mountain-building giants, Gog and Magog. This legend is far from unique to the Hoe; perhaps it references some dim remembrance of continental drift. Today the Hoe is marked by a distinctive eighteenth century lighthouse displaced from the Eddystone reef in the 1880s, a macadam parade ground, long green lawns and a large military memorial from which a bronze memorial plaque was stolen last year and then returned on a wave of revulsion that swept even into the nooks of the local criminal layer. The Hoe overlooks Plymouth Sound, a natural harbour dominated by the comings and going of naval vessels. Though I have visited the Hoe many times over the last twelve or so years it was during this modest student performance that I glimpsed for the first time one of the nuclear submarines that uses the harbour. The resolution of numerous nuclear crises, global and regional – Cuba in 1962, Reagan’s misunderstood 1980s sabre-rattling, the recent India/Pakistan border incursions (and the fictional narratives that have accreted around them: ‘Thirteen Days’, ‘The Hunt for the Red October’, ‘War Games’, ‘Dawn’s Early Light’) – has turned the nuclear narrative inside out. Where once we lived in a nuclear culture of fear and anxiety, of “duck and cover” and “protect and survive”, now it is one of mild dramatic excitement. These crises are rare opportunities for a liberal and heroic individual on any side to make a difference (most usually a pragmatist or technocrat keeping their shoddy options open and rising to the role of hero). But the requirement of these dramatic structures (and of the cultural industries that reproduce them) for the survival of their audience is no imperative for the future. It only takes one leadership to actually believe their own words. At the end of John Badham’s film ‘War Games’ the military at NORAD (North American Aerospace Command) learn from Joshua, their super-computer, that global thermonuclear war is a “strange game. The only winning move is not to play.” But this pacifism, in a military context, is the inverse of, almost an invitation for, a first strike. All nuclear weapons strategies involve general obliteration or the possibility and ‘intention’ for general obliteration: (even if the leaderships do not actually believe in themselves, their enemies must). They are all some version of MAD (mutually assured destruction). In such a context, it is extremely dangerous for anyone to lose interest in ‘playing the game’. The game, of course, is material life and only transcendent principles can distract someone from it. 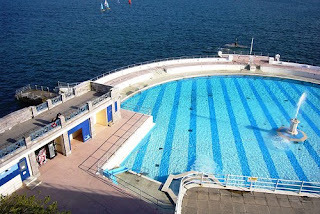 Just below the site of the students’ performance, on the waterfront, is the restored Tinside Lido, where last summer a performance was given by eight dancers under the direction of Stephan Koplowitz as part of his TASKFORCE’s Liquid Landscapes. Koplowitz is a respected choreographer, known primarily for his site-based dances, notably his early work in the windows of Grand Central Station: ‘Fenestrations’. There were moments to be savoured in the Tinside Lido performance, first of observational comedy and then, as the dance piece reached from cubicle-like partitions to the wide expanse of the Lido’s pool, a musical development from rough intimacy to sweeping washes of sound, and a geometrical pleasure as the dancers followed the lines of the architecture. However, there was also an irritation at the piece’s lack of deep engagement with the wider site. The performance had been advertised by its producers as one part of “a site specific performance tour of water related sites”. Koplowitz’s dancers, in swimming costumes, luxuriated in the Lido’s leisure space as they spread themselves around it, and yet they seemed somehow insulated from the vista beyond, a view that continued to impose its authority on the spectator. No sooner had the dancers acknowledged this vista than they had returned to their comfortably and sensually inhabited bodies and the embrace of the waters of the pool. Was there any obligation on Koplowitz to acknowledge the juxtaposition of watery sensual pleasure and naval trajectories, including the invisible glide of weapons of mass annihilation? The starker the contrast the more the dancers seemed to turn to their own surfaces and the enfolding qualities of the site. James Sidaway’s paper ‘Shadows on the path’ (pp. 1091-1116) uses a short urban coastal walk that begins just a few moments’ stroll east of the Tinside Lido, to interrogate the geopolitics of this Plymouth terrain. What strikes Sidaway is the excessive nature of what he has to negotiate and the “problematic of how and what to narrate (even on a single walk) and what remains obscured, passed over, or neglected and what escapes representation”. As a helicopter hovers above, Sidaway describes something like a ‘pan’ across old forts, military antennae and warships offshore: “a chronological layering of defensive and strategic landscapes… The whole landscape is overwritten by this military past and presence, analogous to the way that the granite mass of Dartmoor is itself fundamental to the topographical structure of Devon County”. Sidaway’s use of the geological metaphor is striking and uncompromising, almost un-negotiable. Yet, he is sympathetic to the problems of inclusion and exclusion that anyone encountering this landscape might confront, quoting the doyen of Devon landscape writers, W. G. Hoskins, on the problems of such choices when “a book could be written about every few square inches”. A similar sympathy might be extended to Stephan Koplowitz. His interviews for the local media betray a broad awareness of the landscape’s histories and its controversies. He references well known landmarks and ‘favourite sons’ like Francis Drake. Given that ‘Liquid Landscapes’ was to be performed in eight different sites, it would be unfair to expect a visiting artist to write a book or generate choreography for “every few square inches”. However, Koplowitz’s predicament is as much strategically chosen as it is circumstantially bounded. His interview and essay for Melanie Kloetzel and Carolyn Pavlik’s Site Dance: Choreographers and the Lure of Alternative Spaces (which is packed with insights and informations) is most revealing. He takes a theatrical (almost ‘empty space’) approach to his sites: “most sites chosen provide a “canvas” never before used as a performance space, a tabula rasa”, apparently drawing a strict demarcation between the way that artists perform sites and the way that the meaning of such sites are performed everyday by their other users. This sits in contradiction to his desire for “anything that blurs boundaries between art and daily life”. There is no dishonesty here. Koplowitz is quite frank about the hinge of this contradiction, listing four different approaches to site, the key transition being that between ‘site-specific’ (“inspired by a specific site and cannot be replicated anywhere else without losing its essence”) and ‘site-adaptive’, a generic performance that may be largely devised on one site, but can be adapted sympathetically to numerous spaces. This ‘site-adaptive’ work has “the potential to be the most economical or attractive to make because of the repeatability factor”. It would be deeply unfair to censure Koplowitz for being honest about the economics of an artist’s survival, about those means to gather the resources to make any work at all. What is damaging, however, is the way that this candid pragmatism slides less explicitly alongside an opportunistic trend in a more general discourse about site. It chimes too comfortably with an approach championed forthrightly by Miwon Kwon that offers an alternative to the provincialism and petty-chauvinisms of the ‘local’ (and its sentimental resistance to a fantasised, ‘just-arrived’ homogenising and globalising monster – what of the enclosures? what of various phases of agrarianism?) in the form of a discursive realm that is free from the physical boundaries of the local site. It is this form (much more than Stephan Koplowitz’s honest economics) with its apparently efficacious emphasis on fluidity and mediations of meanings and identities that is in danger of ignoring the ‘thing’ of the site, the accumulated dead labour, the very mechanics of the game of material being. Which brings us back to granite. For what if there is a virtue in the most banal element of the local? In its materiality. The long-standing landmark. The blatant industrial or military mechanism. The insurmountable memory. What if there is an efficacious quality to the most conservative elements of these sites? A certain unconvertible and unexchangeable thingness? Constituting an obstacle, an anchor, a barb or a drag, hanging upon and holding back the (apparently most progressive) trajectories and transitions of these sites, grasping upon their economic and cultural discourses and exchanges, creating a distorting torque upon the multiplicitous ‘life’ of these sites. Such things return to specificity as weapons; small, obstructive and atomised. An empirical inconvenience for even modest narratives. The very banality of these sited things – nuclear submarines, tourist footfall, granite tors and pavement kerbs – if successfully recruited by site-specificity, can operate as a Brechtian disruption of what seem like inevitable, economically fundamental, unchallengeable processes. The conservative ‘thing’ that James Sidaway presents in his paper, catching the reader as if with a barbed hook, or a sudden slamming of the shins by a granite kerb, is the death of his daughter, Jasmin Leila. His regular walking companion along the very route that Sidaway references, she died shortly after the walk that his paper describes, a victim of bacterial infection that Sidaway traces to the inadequate hygiene standards of privatised services at a local hospital. Mapping other cases of such infection across the Plymouth area he defines a plane “of insecurity and danger” that slides, like the disconnections of domestic and military experiences, alongside the planes of nuclear risk and more intimate ‘geographies of fear’ in Plymouth. This ‘unchangeable thing’ renders a contemplative, intellectually pleasing and complacent reading of Sidaway’s paper almost impossible. It is an obstinately elegiac ‘thing’, a mark on the landscape, and it is disruptive too; snagging on assumptions that everything is going to be fundamentally OK, that there is no alternative but what we have we can put up with, that there will always be a resolution, that there is always more room for negotiation, discourse, exchange, that risk eventually resolves itself into an economical ‘rubbing-along’. Instead, there is a stop, a refusal, an end. It also renders a contemplative, aesthetically pleasing and complacently sensual reading of the liquid landscape of the Plymouth waterfront much harder to make. While a ‘return’ to a (never-previously-existing) fundamentalist site-specificity would be a great mistake, nevertheless to the trajectories, liminalities and fluidities of thinking about space and place, could valuably be added the use of elegiac things and hard, unyielding obstacles. On a recent visit to my parents’ home, I was chatting with my daughter, explaining that although my father had been a fighter pilot in the RAF in the early 1950s he had not fought in any wars. “O yes I did,” my father contradicted me, “I fought in the Cold War.” While, with the benefit of hindsight, all the resolutions and compromises of the second half of the twentieth century have taken on a certain retrospective inevitability (a kind of casting back of the ‘end of history’), the reality of sitting inside an armed ‘thing’ with its mechanical specificity, and flying it over a divided Europe had placed my father in a geography of insecurity and danger rather than one of inevitability and pragmatism. And the hard memory of it had not stopped dragging upon him. Such uncomfortable things and their preservation, rather than the sentimental heroics of secretly decent individuals, may soon be required to place their barbs and impose their torque upon fantasies of fluidity and the geographies of heaven.